Is Bottas/Hamilton set to be Rosberg/Hamilton rebooted? Heading in to the Russian Grand Prix life was pretty good for the Mercedes AMG F1 team. A burgeoning bromance was forming between their drivers – in stark contrast to the at times fiery Rosberg/Hamilton pairing. Ferrari were offering a challenge but not quite enough to completely turn the tide of recent F1 form. 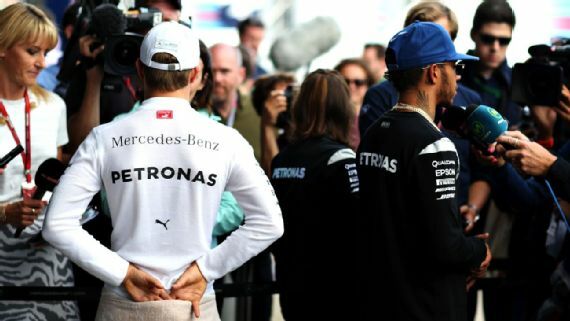 Plus new signing Valtteri Bottas was being a good boy and playing second fiddle to Lewis Hamilton – either by design or by virtue of not being quite as good. Them came Sochi. Behind the celebrations for Mercedes’ 2nd win of the season and Bottas’ first ever, there were anxious looks between Toto Wolff and Niki Lauda. In the fourth race of the 2017 F1 season Bottas had comprehensively out performed, out qualified and out raced his illustrious teammate. And a problem the Mercedes management hoped would not emerge signalled its intention to do just that. In isolation Bottas’ performance at Sochi was impressive but perhaps should not have come as a surprise. The Finn seems to understand the Black Sea track better than anyone else on the F1 grid. Those uninspiring 90 degree turns bring out the best in the former Williams driver. The big surprise was how poorly Hamilton fared pretty much all weekend. That combined with Bottas’ stellar form raised more than a few eyebrows in the paddock. Is Bottas as good as (or perhaps better than) some people thought he was? Possibly. Why did Mercedes opt for Bottas? Mercedes opted for Bottas for several reasons to replace Nico Rosberg this season. A major factor was undoubtedly the suspicion that he would keep Hamilton honest, but not get under his skin or in his way as much as the perennially underrated Rosberg did. Or a Fernando Alonso would undoubtedly have done. One race – especially Sochi – is too early to tell whether Bottas can really challenge Hamilton. The one-time race winner will need to translate his form of the past weekend in to more wins at the rest of the circuits on the F1 calendar to be a serious challenger in 2017. But for Mercedes the bottom line is that if Bottas can carry his Sochi form over to more races consistently, the professional relationship between him and Hamilton will inevitably deteriorate. And this is why. During the Rosberg/Hamilton era at Mercedes, there were times when all seemed relatively calm. This regularly coincided with a specific set of circumstances: Hamilton dominant and confident, Rosberg unsettled and unable to challenge the 3-time World champion. As soon as Rosberg started to beat Hamilton or get in to his head, the relationship deteriorated. One of the great flaws of Lewis Hamilton is his habit of reverting to a state of childish anger and selfishness when things do not go his way. Rarely in the past did he congratulate Rosberg without caveating each statement. No matter the outcome of a qualifying session or race, it was all about Hamilon. Either you lost because he was brilliant or you won because he was not at his best. The less than subtle sub-text was that it did not really matter how Rosberg (or anyone else for that matter) performed. What happens next between Bottas and Hamilton? Hamilton’s increasingly panicked and moody radio communications on Sunday were, I think, a harbinger of things to come. Assuming of course that Bottas can replicate his form in more places than just Sochi. If the Finn can do that and maintain that steely calm he and his compatriots exude, Toto Wolff and Niki Lauda might just wish Nico Rosberg was still in the other Silver Arrow.